Close up of Miss Bomb after being hand dried. Tess on the able having been hand, blast dried. Looks more like a fluff bomb then ever. Several years ago I completed an online dog grooming course. The idea being, was to learn how to care for my Cocker Spaniel's coat using clippers and also to save money on grooming fees. I found the course surprisingly interesting and the course set me on the path of a new hobby. Although I would never claim to be an expert and I wouldn't consider myself competent to sell skills as a dog groomer. The course prepared me well to care for cocker spaniel coat. 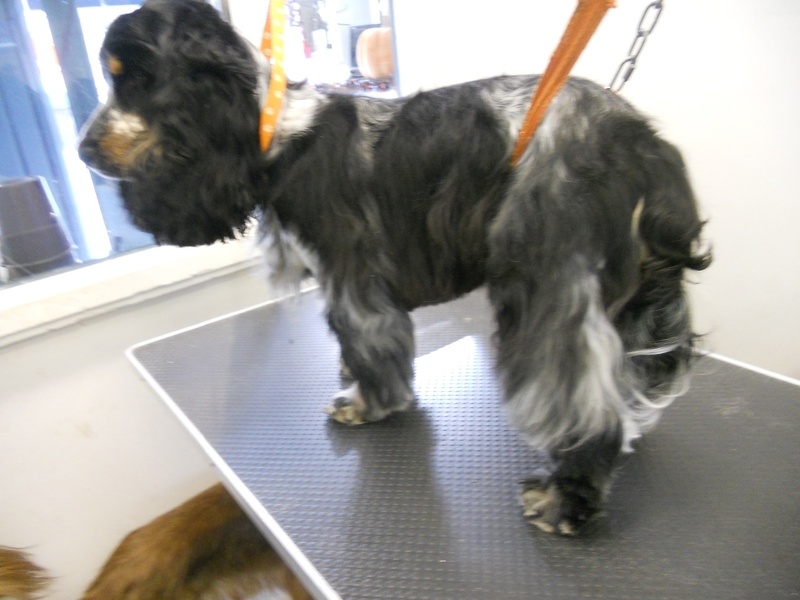 So Georgie is groomed regularly, clipped or tidied up every other week, or thereabouts. Brushed most days and she gets bathed regularly to, mainly due to necessity, she likes muddy puddles! Using clippers I have found is a skill that I have become reasonably adept with. When Tess (one of Georgies pups) came along, I decided that I would like to show her and as such her coat would need to be hand stripped. However, hand stipping is a completely different ball game. The online course didn't really give me the practical skills needed to perform this task. I managed to pick up various bits of advice about what to do and what not to do - but I didn't really feel competent. There is a belief with some people who have said to me, that hand stripping is cruel. Now, I don't want to do anything cruel to any animal and least of all to my own dogs. So I questioned myself, how cruel is hand stripping? I came to the conclusion that hand stipping is cruel only if upsetting to the dog. That the coat when ready will come out with ease, so therefore doing hand stripping too early could be uncomfortable and upsetting to the dog. Tess is used to being brused on a daily basis and at nine months old she looked like a fluff ball. I was advised by a kindly dog groomer that her coat was about ready for the task of hand stripping. I was advised to purchase a 20 blade coat king. This is a comb used specifically to strip out the old coat. It seemed to be effective, however, I still wasn't sure whether I was using the coat king correctly. Not because Tess objected to being groomed with the coat king, but because I did not want to ruin her coat. It is my belief that once ruined then the coat will never recover - also if the coat is clipped then that apparently is it, you can never hand stripp the coat. I also found out that although the hand stripped coat would need to be kept brushed and tidied up from time to time, once done, then you will not need to go through the whole process of hand stripping the entire coat again. I was on a quest by this time to find out how to hand strip my cockers coat and what's more to do the job properly. It was a real mission, because I found that I would be offered small bits of advice here and there. I googled and googled and eventually came up with the answer. I found a dog grooming school that would teach me how to do hand stripping. 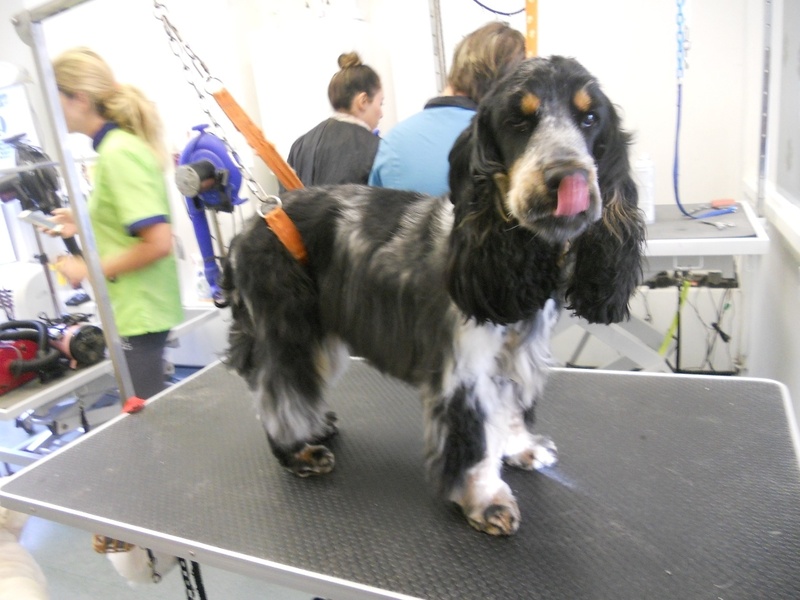 Dogs Delight grooming school in Chiswick, West London will allow you to take your dog along for the day and teach you right from the beginning how to care for your dogs coat. There is a cost involved, but I consider the cost to well worth it. So when Tess was 10 month old, off we both went for the day to the grooming parlour. I will attempt to go through the day as best I can in numerical order. However, I am not an expert and should you follow any advice from this web page/web site then I cannot accept laibility should anything (unlikely though it may be) go wrong. I would suggest a hands on course with the experts. To begin with, it is best to go along with your dog whose coat has been thoroughly brushed through, removing as many matts as possible. 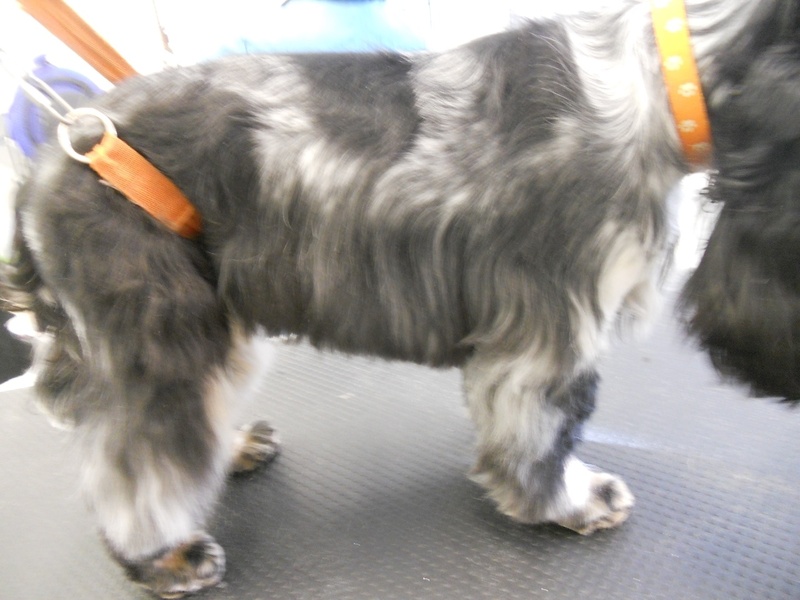 Problem areas usually occur behind the ears and under the front and back legs. Any knots or tangles in those areas will probably be best to be cut or clipped out. 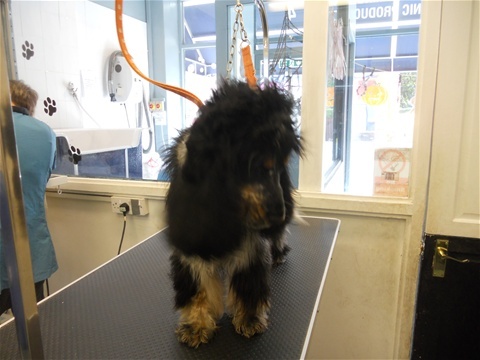 Tess was bathed using a good quality dog shampoo and conditioner - its a good idea to use a scrunchie as this helps to free up the dirt and debrie and encourage the dogs natural oils to flourish. After that Tess was hand dried. Using a professional dog hair dryer. It is best to concentrate on one area at a time, to ensure a thorough drying. Next came a thorough comb through and some of the looser bits of the coat started to come away. I found it really invaluable being shown how to do the drying and combing through using the correct technique. After a lunch break and a walk, we started the grooming process using a carding comb, This is a comb with small prongs that you drag through the dogs coat, in the direction that the hair is growing, following the grain, so to speak. Its difficult to explain the technique used, but its a bit like peeling an orange, but of course it is loose hair that is coming out (not skin, ouch) I will attempt to explain things using photos. Brushed through but still looking like a fluff bomb - side view. Her coat feels really silkie at this stage. The straps are just there to stop her from sitting down. With the use of a carding comb, her coat is gradually being pulled out - you will note please that she is quite at ease here. She then has a thorough brush through with a slicker brush (shown). Side view, showing off a nicely trimmed skirt. 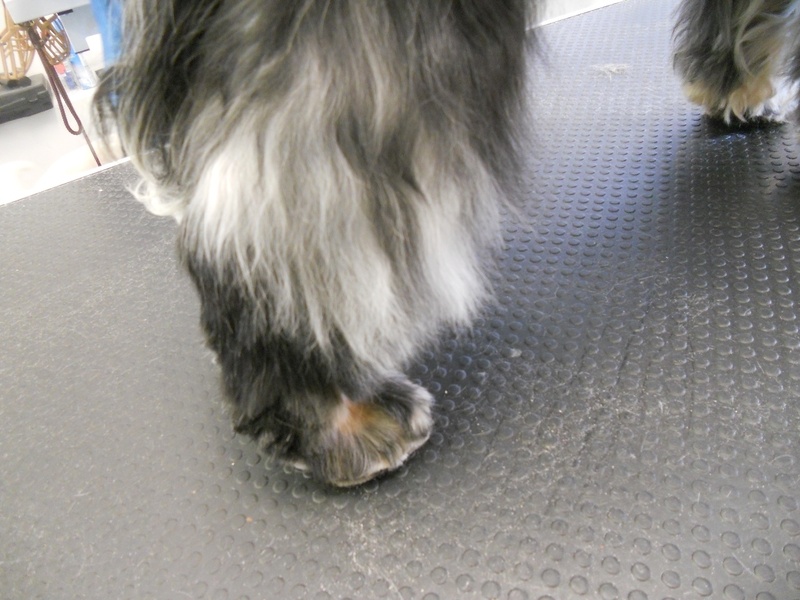 The back feet, fur is trimmed at the back to the level of the hock (the bony bit - where the bend is) and at the front of the back leg somewhat lower. The feet are trimmed to give an appearance of a 'cat like' paw - with the fur between the pads being trimmed and the toe nails tidied up. Trimming nails though is an art in itself. Only the very ends should be trimmed as if they are cut too far they will bleed. Please see my other page on grooming regarding what to do if the nails is clipped and bleeds - try not to worry though, we have all done it! 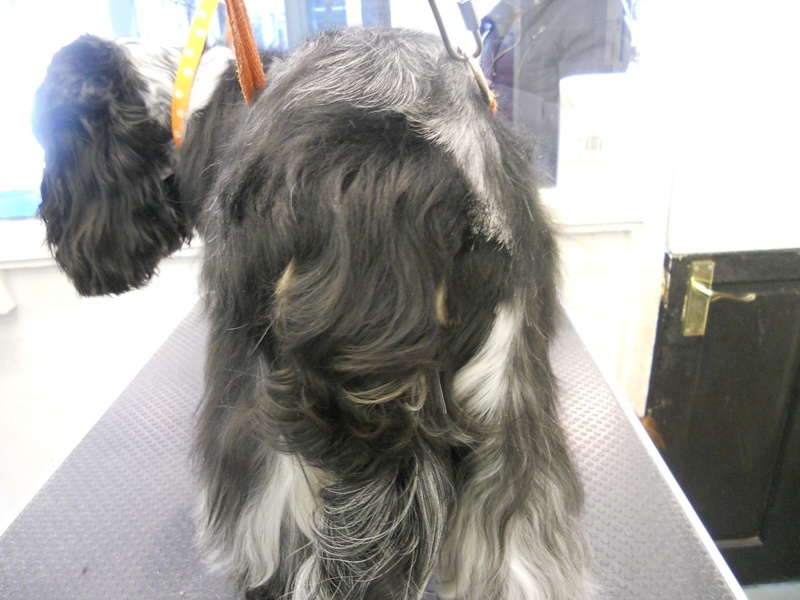 Fur on the upper outer back legs can be thinned out using thinning scissors. As you can see the front paw is trimmed slightly differently to the back paw and is trimmed flatter to have an almost 'foot like' appearance. 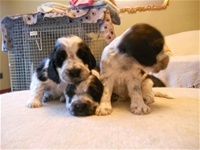 Fur on the upper outer side of the front legs can be thinned out, using thinning scissors. 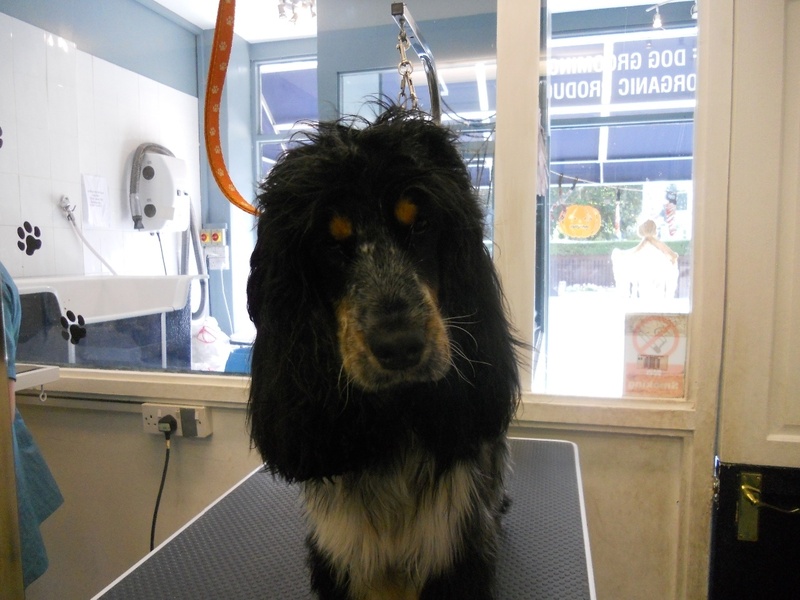 Front view, showing face that has been clipped using a hand held cordless clipper, the only part of the dog that is acceptable in the show ring to be clipped. I used a Moser ARCO, cordless clipper in the parlour and was so impressed went out and got myself a clipper from Christies Direct. Although not completely silent the noise and vibration are as low as is possible. Tess even had her whiskers trimmed off and her eyebrows have gone. The ears though are not trimmed. 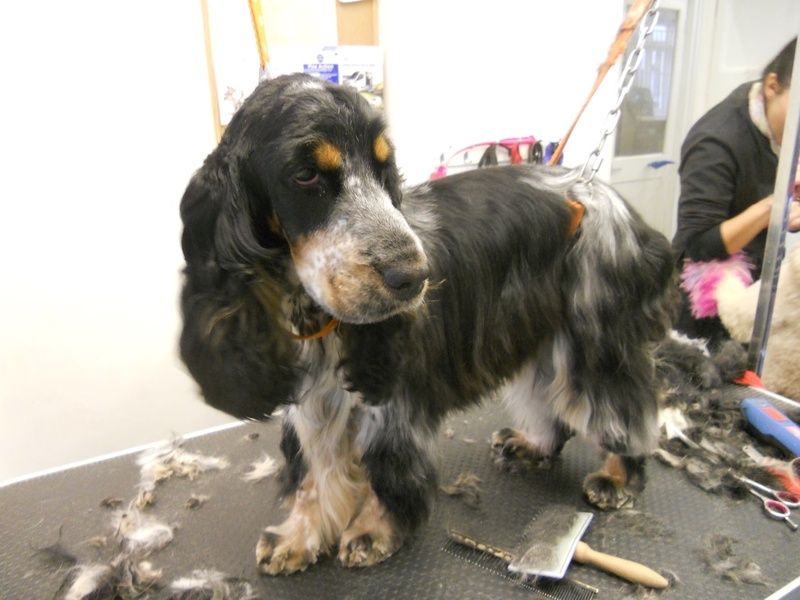 Although by comparison the cocker coat that is clipped, the ears are usually clipped to about a third down. From a length perspective, she only had about .1/4 inch trimmed, just to even up. But remember this is for the show ring, if you wanted a shorter ear, at least another inch of hair could be chopped off. One of the things I really liked about the day course was that I was shown how to hold the scissors correctly, thus minimising if not eliminating the risk of accidently nipping the dog. This was one of the things that I am most nervous about, but I came away feeling much more confident. Last but not least, the tail is trimmed - although not shown here - as I decided to trim up her tail at a later date. But for the show ring the tail will need to be trimmed. 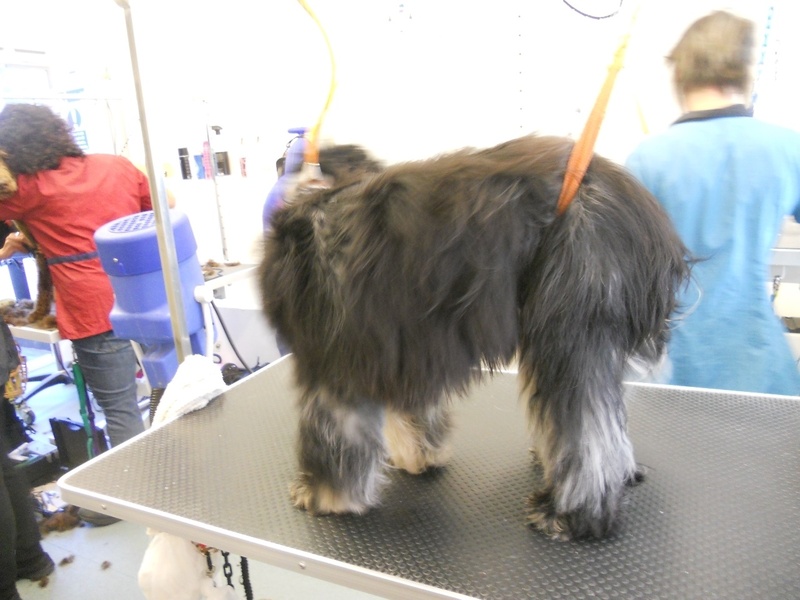 The area around the back passage, known as the rosette, should be tidied up and any knots or mats around the back legs will need to be clipped or cut out, not many dogs will appreciate this area being combed through.